Language Log » "Whose speech is free of p3's"
"Whose speech is free of p3's"
I am generous with surplus  of food: there is no lack for one to whom I give. I share the greater portion of meat with those who sit  next to me. I am one beloved of his kindred, to whom his family is attached. I have not hid my face from the one who is in  servitude. I am a father to the orphan, a helper of widows. No man has gone to sleep hungry  in my domain; I have hindered no man from the ferry; I have cut down no man less powerful than I; I have tolerated no  slanderer. I am one who talks according to the style of officials, free of outmoded speech. I am a proper judge,  who shows no partiality to the one who can give rewards. However, there's something about the museum-site's translation that seems odd to me. 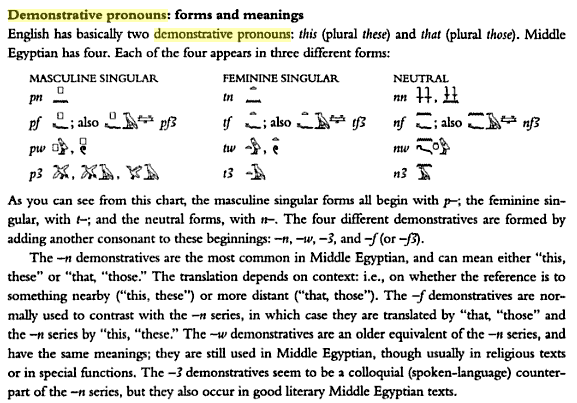 Prof. Allen's explanation in Middle Egyptian is that "the -3 demonstratives seem to be a colloquial (spoken language) counterpart of the -n series", which eventually turned into a definite article, and "at one time […] was considered a mark of lower-class or 'street' language". But the translation of Mentuwoser's Stela boasts that he "talks according to the style of officials, free of outmoded speech" — whereas being "free of p3's" would apparently have been the opposite of "free of outmoded speech", and more like "free of innovative colloquialisms". I am a diligent subordinate in the king's house, who is sent on missions because of decisive character. I have acted as granary overseer during the counting of  barley; I have acted as overseer of more than 3,000 people; I have acted as overseer of cattle, overseer of  goats, overseer of donkeys, overseer of sheep, overseer of pigs; I have directed clothing to the treasury;  account has been taken by me in the king's house, and I have been acclaimed and thanked. I am wealthy, well supplied with fine things: there is nothing I am missing in all my things. I am an owner of cattle, with many goats, an owner of donkeys, with many sheep. I am rich in barley and emmer wheat, fine  in clothing: there is nothing missing from all my wealth. I am well supplied with boats and rich with vintage. This blog is really interesting. The text and what it appears to say is really interesting too, as its one of the few cases I know of where Egyptians seem to talk about their own language. The transliteration and translation can be a bit variable for this text, particularly the translation of pA. In the first translation by Allen it is taken to be the definite article. This is seen to be low speech I think because pA is used as a demonstrative in Middle Egyptian but in Late Egyptian 'low' dialect it is the definite article 'the'. In the second translation it seems to be taken as the verb pAw, a conjugated form of pAi 'to have done in the past', which seems to me to be more likely. The problem with this is this word is never determined with the 'speech' determinative. The online worterbuch even has a word pAw (?) written this way as 'anything unseemly'; perhaps the meaning of the word then is old or anachronistic speech. Although the scribe could be merely amending the word pA 'the' by putting the speech determinative after it to indicate the spoken word. I am one who speaks according to the state/presence/style of the officials, empty/free of saying that which was in the past. 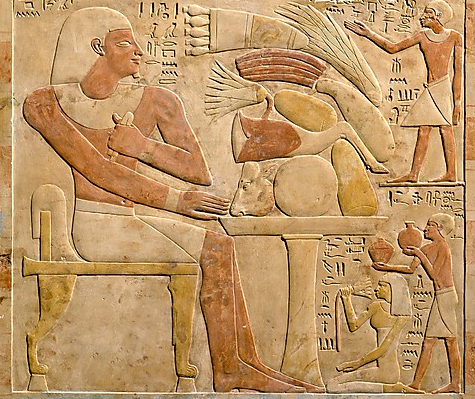 The other reason why I would err to the side of the verb pAw as opposed to 'the' is that in this stele the scribe seems to more regularly use the plural strokes than the quail chick to pluralize words. Although I can see one or two exceptions to this in the stele. However, the idea of not speaking like the past doesn't really seem to fit with Egyptian cultural precepts, where the past is usually seen as something to be emulated rather than shunned, unless the speaker is referring to the immediate chaotic past of the First Intermediate Period. It's really interesting stuff and not altogether clear what way to take pA. It'd be nice if there were some more examples of it. This period apparently has the first attestations of some late egyptian-isms in some letters etc so it would make historical sense if the official was saying I don't use the 'low' pA-speech. Pure guesswork – but perhaps the Egyptians of this period in fact believed that lower-class speech was in fact archaic, as not having progressed to the sophistication of official speech. I don't expect they had anything llike our understanding of language change. (I seem to remember reading that even Dante did not understand that his own speech was actually descended from Latin, but supposed that ther had always been a diglossic relationship between the two.) We know that the p3-series is innovative, but Mentuwoser may well not have done. If he was aware that these forms were absent from older records, perhaps he would have interpreted this as a matter of register rather than age. Does anyone know whether he really avoided p3's, or just avoided using them with the non-standard meaning of his time? The extracts seem to be short on demonstratives, so if his writing is unknown elsewhere, I suppose there might be no way to tell. It's probably too much to hope for that there would be a non-standard p3 on the stele. An Occamian explanation: perhaps "outmoded" does not mean what Mr. Allen thinks it means? I've certainly had commoner words misdefined in my brain. "Whose speech is free of p3's" sounds like a more literal translation than "free of outmoded speech", so I would expect "outmoded" to be the second translator's interpretation of why not having p3's would be a good thing. I don't think it should surprise us that someone would consider his linguistic conservatism primarily a moral virtue rather than a political or economic one. This guy wasn't dropping his p3's for the king's sake or because it would making him rich; he did it because it's the right thing to do just like feeding the poor and upkeeping justice. Finally, I find the "demonstrative pronoun turns into definite article" feature fascinating. I knew this had happened in Romance languages and can infer that Germanic languages must have gone through something similar (since PIE had no definite articles). If the same thing happened in Egyptian thousands of years earlier, that hints that it might be a universal tendency. But if that is so, where do the original languages without a definitene-indefinite distinction come from? Are there examples of languages that have lost definiteness over time? Very tangentially related: In Astérix et Cléopatre the scribe recites a "spelling rule" for hieroglyphs, similar to the traditional English "i before e except after c…." I'm not certain how strong the historical evidence for this rule is, and in any case the scribe appears to be less than thoroughly competent. @Henning Makholm: Yes, I have come across people who act as if using "bad grammar" (in their case, in particular singular "them") was somehow immoral, not just mistaken. So grammar can definitely be seen as a moral issue! And I second your second question: are there languages that have lost the definite/indefinite distinction? Could there be a urban (innovative, sophisticated) vs rural (conservative rube) factor expressed here? Does anyone know what phone "3" represents? "I am wealthy, well supplied with fine things:"
Whoa, we figured out who Kanye West was in a past life! No-one knows exactly what Egyptian sounded like, since like classical Hebrew vowels were never marked, the whole language has been reconstructed from texts and there was a lot of phonetic change over the 4000 years it was a spoken language. Sorry I'm still trying to process and heed the aforementioned "Never end a sentence with a [bird symbol]" rule. "I showed Thursday's brilliant Non Sequitur comic about ancient Egyptian grammar police ('You never end a sentence with a bird symbol') to some friends," writes Chris Lockley, of St Clair. "One mate, whose son-in-law happens to be an Egyptologist, told me that if it was a quail in the hieroglyphic, you actually can end a sentence with one. A quail is a 'w' which is an 'oo' sound, as in 'moo'. You add a 'w' on to the end of a sentence after a full stop on certain occasions, to adjust the tense or gender of a word. "Are there examples of languages that have lost definiteness over time?" The emphatic or determined state [which contrasts with the construct and absolute states] is an extended form of the noun that functions a bit like a definite article (which Aramaic lacks; for example, kṯāḇtâ, 'the handwriting'). It is marked with a suffix. Although its original grammatical function seems to have been to mark definiteness, it is used already in Imperial Aramaic to mark all important nouns, even if they should be considered technically indefinite. This practice developed to the extent that the absolute state became extraordinarily rare in later varieties of Aramaic. [i.e., no distinction was made on nouns between definite or indefinite; in adjectives, the absolute/emphatic distinction denoted a distinction between adnominal and predicative uses]. I'd be surprised if there weren't other examples out there. "P3s" are absent in my speech. @Matt_M, Abkhaz also uses the "definite" article (prefixed /a-/) on most otherwise unmarked nouns. Often it's referred to as a "definite-generic" article for this reason. This contrasts with its sister-language Abaza, which has the prefix a- serving in a more restricted definite function. Regarding demonstrative–>article, I have seen it suggested that Mandarin's proximal demonstrative 这 zhè is in the early stages of a move to an article. Not really sure how you'd define a transition point between the two, though. And perhaps it would be interesting to know if any definite articles come from somewhere other than a demonstrative. Perhaps the Norse suffixes -en, etc.? Or Arabic -ال (which operates arguably as an inflection instead of an article, anyway)? Regarding the -en/-et suffixes in Scandinavian languages: yes, they did apparently develop from a post-posed demonstrative, namely (h)inn/(h)it: compare Old Icelandic hinn ulfr (that wolf, the wolf), ulfrinn (the wolf), presumably from ulfr (h)inn, (that wolf, the wolf) – the word order [noun demonstrative] was normal in the pre-mediaeval Norse attested in runic inscriptions. I think something similar happened in the South-Eastern European languages like Romanian and Bulgarian that have suffixed definite articles.